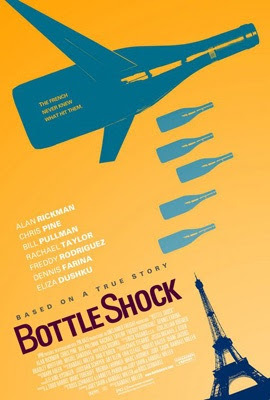 It is hard to imagine a film with wine, wine history, boxing and Hemingway not appealing to Mark but that is the weird scenario with the film Bottle Shock. This work is based on an offhand event that was picked up by the world media in 1976 and recently came back into focus as a significant historical event not only for the US wine industry but for the international wine industry. This event was the now famous wine tasting arranged by a small wine seller where California wines were pitted against French wines. Only one journalist (from Time) bothered to attend. The stunning result was that the California wines trounced the worldly, venerable wines from France and the ripple effect from this can still be felt today in the wine market. Bottle Shock focuses on one of the vineyards that had wines in this competition. Chateau Montelena which won the competition for the white wines in this tasting. The proprietor of this operation is Jim Barret (Bill Pullman), a perfectionist and a bit of a blowhard who settles even the most minor disagreement with his son Bo (Chris Pine) in a makeshift boxing ring on their vineyard. Bo is a 70's era stoner and well on his way to being a "loser" (his words). He does exhibit some real appreciation of wine and is intuitive in his handling of the harvest in ways his father is not. Into this steps Steven Spurrier (Alan Rickman) an owner of a small, bespoke but underachieving wine shop in France. As an Englishmen, Spurrier is inevitably on the outside looking into the serious politics of French wine. He along with his close friend Maurice (Dennis Farina) decide that there must be other wines in the world with world class qualities other than French. Thinking he might be able to tap into something new and make a name for himself, Spurrier travels to Napa Valley where the winemakers have an excellent product, but lack the PR to raise the public awareness of this and also lack the awareness of the excellence of their own product as well. Naturally Spurrier finds not just one great wine, but several all of which will eventually shock the world into recognizing the interesting and noteworthy wines of this region of California. In between the story of Jim, Bo and Chateau Montelena play out their own personal dramas with fights, a love triangle with Samantha ("Sam") an intern played by Rachel Taylor, and there own egos and self-doubt. The filmmakers focus on the soap opera aspects of the film's protagonists at the CM vineyard and this is why the film is ultimately a failure. The younger actors are especially ineffective and poorly directed. In particular, the character of Bo is scripted and portrayed in such a way as to be very unattractive and annoying. It is hard to get much sympathy for him and the horrible wig Chris Pine wears throughout the film is unbelievably amateurish and distracting. Samantha is scripted as an ideal, romantic love interest but Rachel Taylor's generic looks and acting aren't up to this notion. Only old pro Bill Pullman manages to make Jim's conflicts authentic and meaningful. Unfortunately this only acts to highlight the younger performers ineptness. It is up to Rickman, a truly great actor to keep this enterprise afloat, and against all odds he manages to pull this off. His part, as the others, is not particularly well-written but he somehow manages to be nuanced and wry while the other performers are stuck delivering ham-fisted speeches and over-acting scene after scene. Rickman even manages to make eating out of a bucket of Kentucky Fried Chicken funny. If not for him, the film would be a disaster, with him, the film manages a degree of watch ability. What else? Well, the Bicentennial aspects of the film are underplayed; there is no sense of why the Montelena vineyard is having difficulty (it was almost 100 years old at the time); there is no sense of the triumph of the moment when the US defeated the French (it is note exactly Rocky another Bicentennial underdog) there are other problems. Interestingly enough, there is a two minute epilogue about the aftermath of the events and the characters in the film that is very elegant and witty (how that happened it is hard to say). American films about wine are not very common. Of course there is Sideways (very overrated and not really about wine) and a film from about 1990 called Year of the Comet with Tim Daly (which is not a classic, but hardly a disaster). The story of the Paris Tasting from 1976 is a great drama (see the book Judgement of Paris by George Taber), and there are reports that a second film is in pre-production dramatizing the events of 1976. Hopefully it will get it right because there is a great movie to be made about this historic event. Mama Lombardi’s in Holbrook , NY ( Long Island ) is perfect if you are in a very specific kind of mood (don't mind being jostled, don't mind competing for seating and the jar of parmagesean cheese). Mainly, the place is appealing to us if we want good quality food that is cheap, fresh and satisfying. The take out section which is where we usually eat has little ambiance, but it is appealing and good people watching. Lombardi’s staff are efficient in dealing with a lot of people(usually badly behaved and impatient customers) and a lot of orders. Favorites are the Arugala, Endive and Radicchio salad and the whole wheat pizza. The house wine is a surprising bust for an Italian restaurant, but hardly undrinkable. There are a couple of other sections including a bar section and a more traaitional fine dining area that we have tried but not enjoyed as much as the take out section. There are other parts of the Lombardi’s empire in Holbrook including an impressive catering facility next door and a wonderful Italian grocery store a few blocks away as well. (Look for a post on the grocery in the near future).